Supplied by ship nine months of the year and serviced by a 2' tram, the Von Leipnik Interplanetary Transportation Co. is located on a small island in Lake Superior. The site includes a machine shop, library, laboratory, astronomical observatory, as well as a hand-full of other structures. It's 1926 and Otto von Leipnik is working hard to repeal the 2nd law of thermodynamics in his quest to push the frontiers of technology. 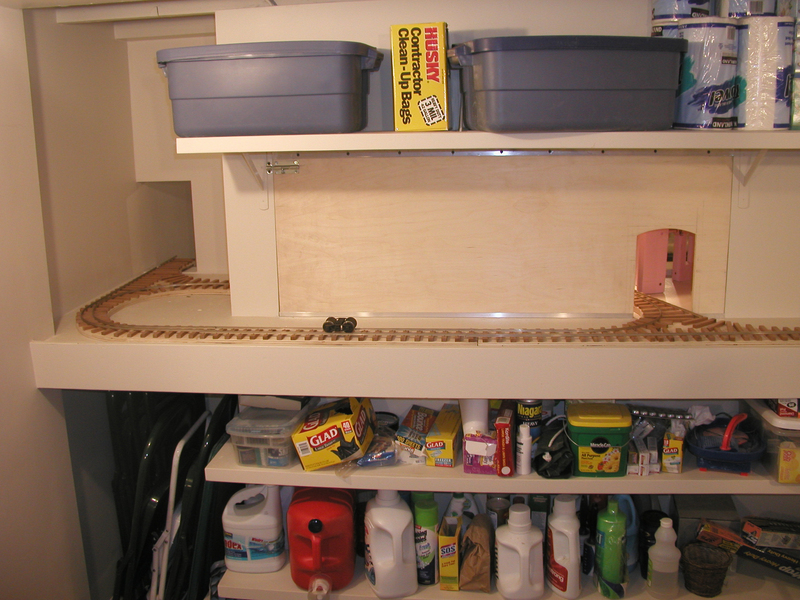 The majority of the layout resides in a bookcase/wall that separates my modeling area from the laundry room. On the right half of the scene you are looking out through the machine shop at a ship bringing in supplies for the laboratory. 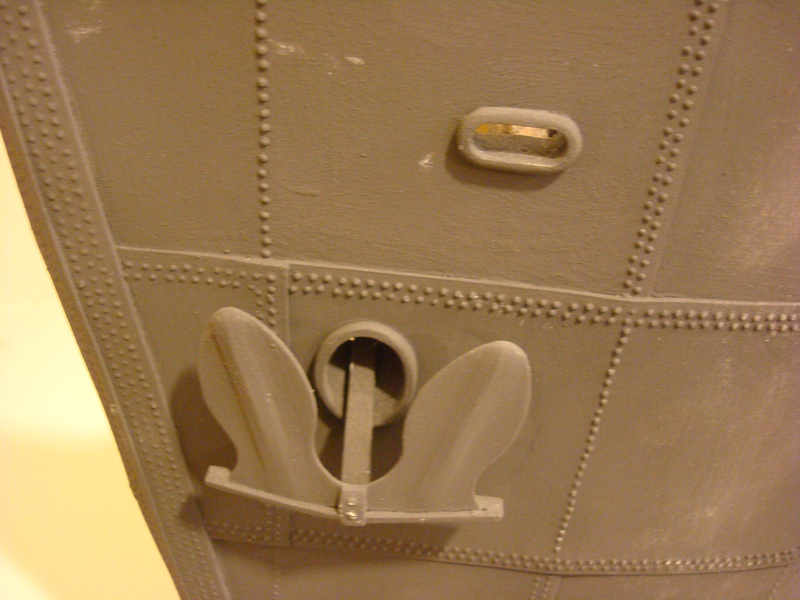 Only part of the ship's hull fits into the scene. When its finished the machine shop will be a brick structure with a variety of machine tools scattered about, a line shaft powering the equipment, and overhead crane. 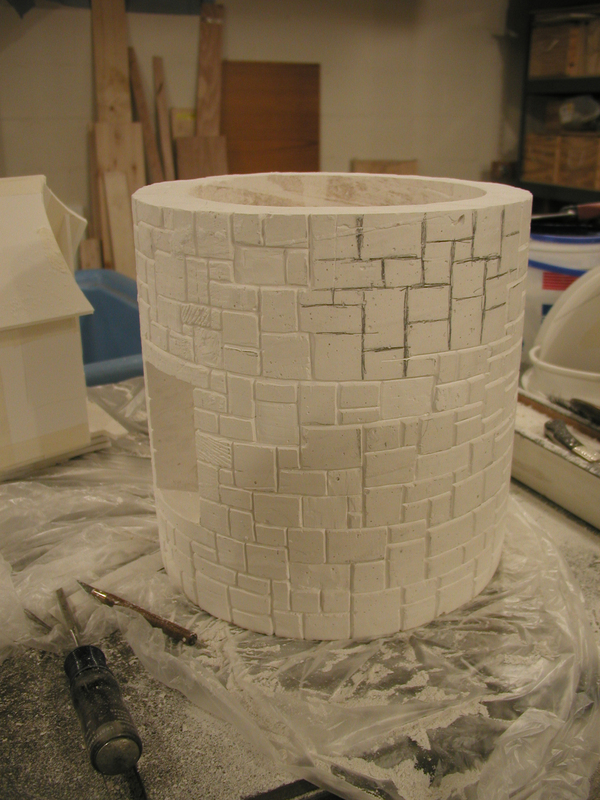 Recently I have been working on producing plaster 7/8'ths scale bricks for the building. The left-half of the scene opens onto a wood and sheet metal building that is built out over the water. The laboratory is housed on the main floor of the two story structure with the library and study above in a loft. In the laboratory all manner of rocket parts, perpetual motion machines, and robots will be in the midst of fabrication. 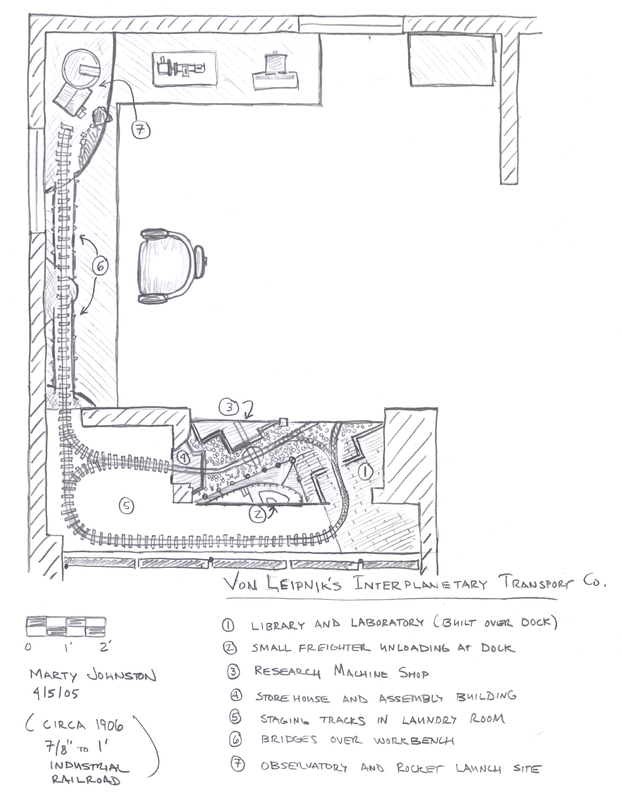 Track work runs through all of the building facilitating the transportation of various components to the test site and launch pad by a small industrial railway. The tramway also serves the small observatory out on the eastern point of the island separated from the main island by two deep channels. 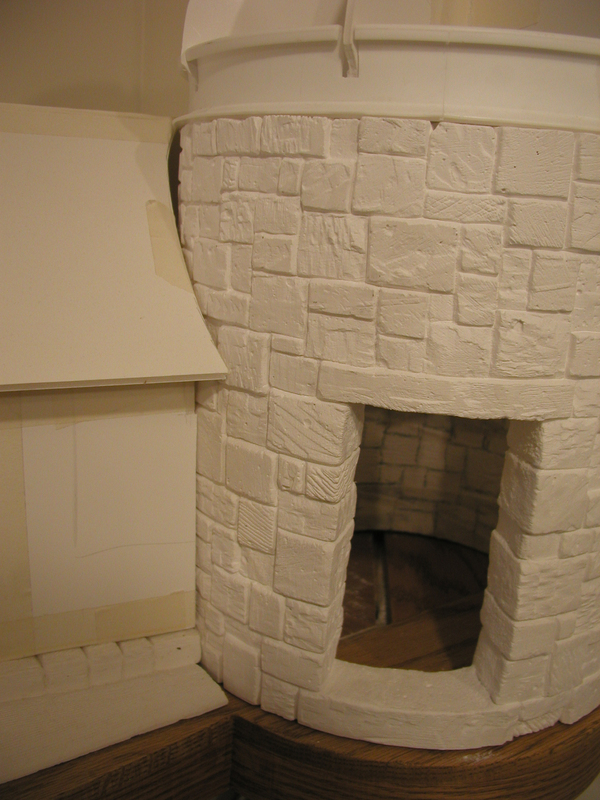 The observatory, tunnel face, bridge abutments, and rock outcroppings are all plaster casting that will be colored once the carving is completed. The ship is a composite of small freighters that served on the Great Lakes. To simulate the iron plates I embossed styrene sheets with rivets. The panels were then painted using an iron based coating that will be weathered. 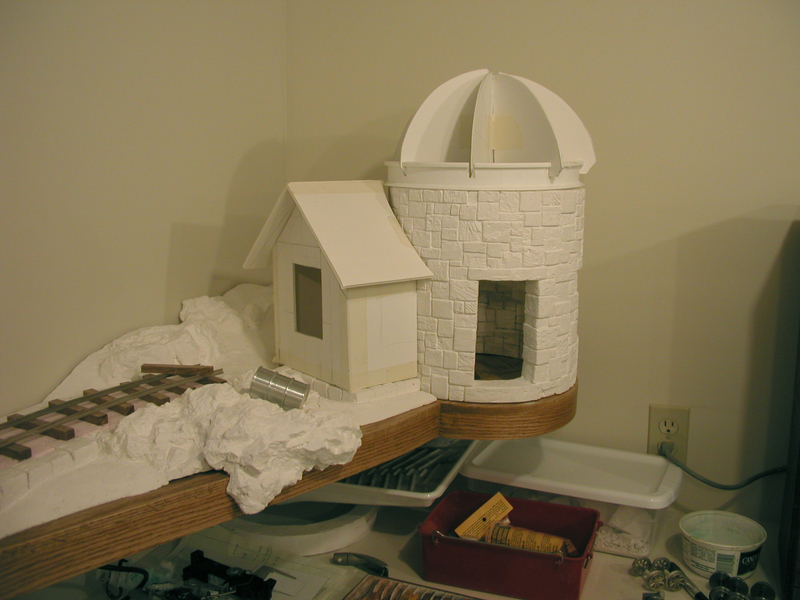 The wheel house still needs to be painted and detailed. 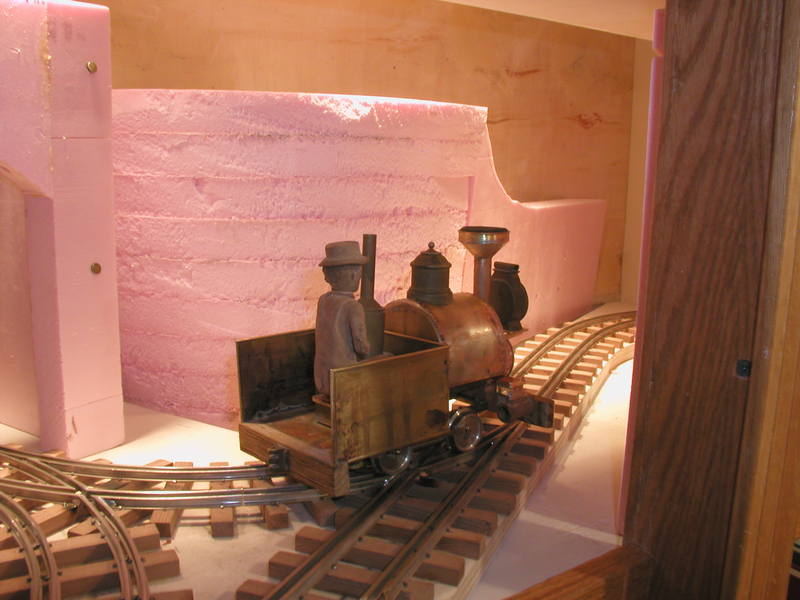 The track work is all hand laid and embedded into the scenery. By widening the gauge slightly, and limiting the locomotives and rolling stock to two axles, the radius can be keep to a very sharp 10 inches. 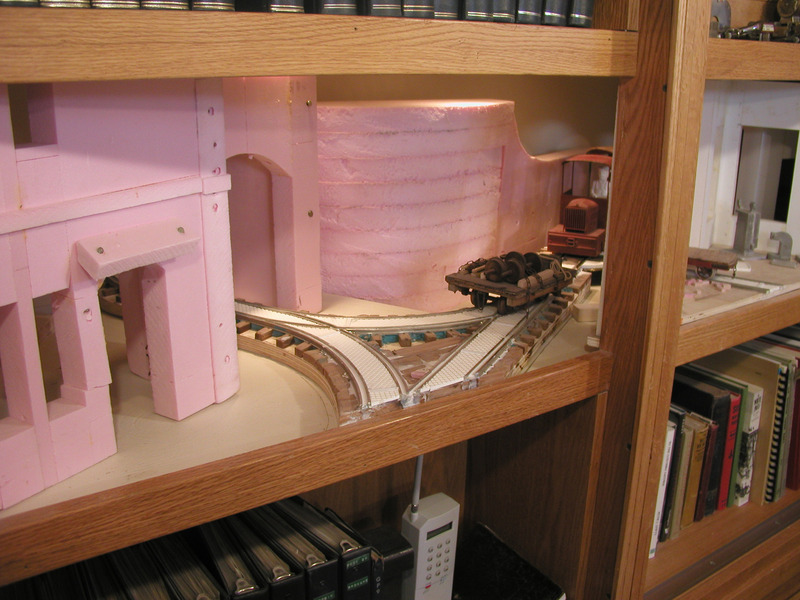 The wye at the front of the layout is nonfunctional but the wye in the back allows for reversing trains as well as running out over the bridges to the observatory. Since the trains also run in the garden I have opted for Locolinc radio control. This really simplifies the wiring. The machine shop is served by a small turntable. The turntable is powered but not indexed. Aligning the rails gives the operator something to do. 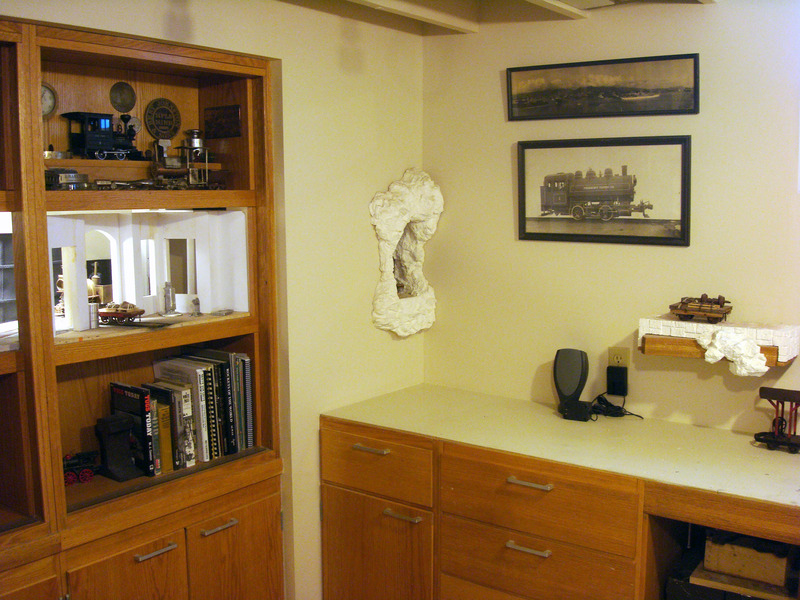 The observatory hangs out over my work bench. The main building was cast in plaster and then the rock details were carved in. A small telescope similar to the one shown in the picture from Syracuse University will be housed in the dome. A small wood study is attached to the side of the observatory.